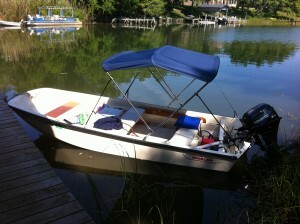 There has been a lot of discussion about what size engine is needed on the 13 foot classic Boston Whaler. The boats intended use has a lot to do with this answer. In all cases below, a hydrofoil such as a Davis Doel Fin, an SE Sport Stabilizer or a Stingray Hydrofoil will help the boat achieve a plane and operate more efficiently. Especially in rough water. Lets first start with the absolute minimum engine needed to plane the boat. This is going to vary between a 9.9 horsepower and a 15 horsepower motor. A lightweight Whaler with a lightweight person aboard can possible achieve a plane with a 9.9 horse motor. And as stated above, a hydro foil will help. If the boat has more than one person aboard or is heavier because of water intrusion then this will not be enough horsepower. A 15 horsepower outboard will more easily achieve a plane even with more than one person in the boat. The top speed will be around 15 – 17 miles per hour. If you intend on pulling a wake board or skier you will probably be disappointed in performance. For a single person who uses the boat for fishing a 15 is going to be sufficient. Your gas mileage will be great and you will be able to troll at slow speeds very well as well as get up on a plane and get home on time. A 20 horsepower motor is the minimum that you will need if you want to carry several people at one time and want to pull wake boards or kids on water skis. It will get onto a plane very easily and travel about 20 – 25 miles per hour. Gas mileage will still be great and trolling still nice and slow. We have a 20 horsepower Tohatsu with electric start and tilt on ours. It is great for the kids because it does not go too fast but its still fun and feels like your flying even though you are only going about 20. As you go up from a 20 horsepower you will no doubt want to switch from a tiller steer motor to a steering wheel. As a general rule of thumb you get about a mile per hour from each horsepower. A 20 hp will do 20, a 25 will do 25, a 35 will do 35 mph and so on. 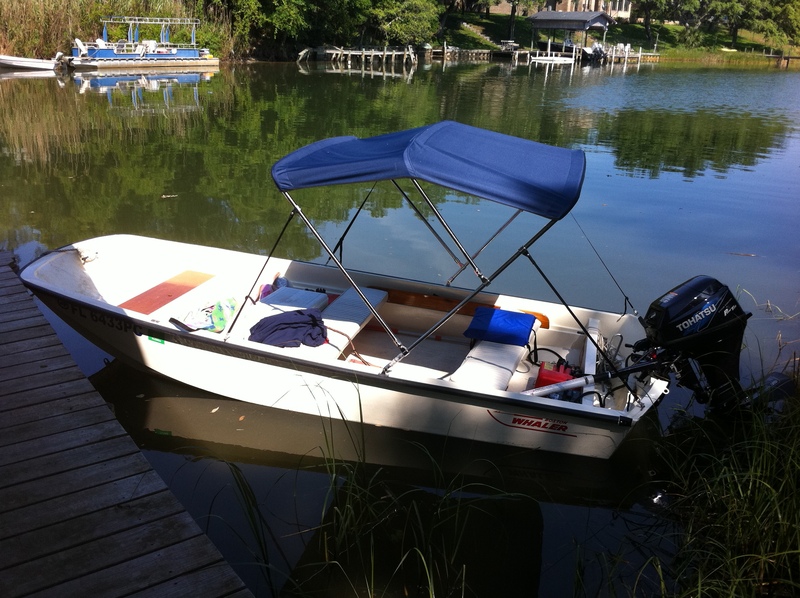 A 40 horsepower motor is the largest that I would recommend for the boat. It will carry you along at about 40 miles per hour and will put almost any size skier. You would need to be careful traveling at high speeds in rough water. A motor this size is not recommended for kids or beginners. Keep them in slower boats for their own safety. A motor larger than a 40 becomes dangerous for several reasons. First it is too heavy for a 13 foot boat. On a classic pre 1972 boat the transom would almost be under water at idle. Second, it will make the boat go too fast. 13 foot boats do not need to be going 50 miles per hour. A dive into a wave can easily throw everyone off the boat. Also, a quick turn can flip the boat. Going fast in a boat is fine but it needs to be done in a longer more stable boat. For the 13 foot classic Boston Whaler stick with a 40 horse or below.